Gianfranco Zola OMRI OBE (Italian pronunciation: [dʒaɱˈfraŋko dˈdzɔːla]; born 5 July 1966) is an Italian former footballer who played predominantly as a forward. He is a football manager and coach and is the assistant manager of Chelsea. Born in Oliena, Zola signed his first professional contract with Sardinian team Nuorese in 1984. In 1986, he moved to the Sassari-based team Torres, where he spent three seasons. He was noticed by Luciano Moggi in Serie C1 in 1989, he signed for Napoli in Serie A for ₤2 million, making his debut that year. The young and talented Zola scored two goals as understudy to Diego Maradona as Napoli won the Serie A title in 1990, the only league title of Zola's career. Zola scored his first goal against Atalanta, whilst his second goal was scored against Genoa, during injury time, which allowed Napoli to win 2–1 and maintain a two-point lead over Milan, who were Napoli's main title contenders, in second place. Zola was excited by the transfer, and he developed an important friendship with Maradona, who commented "Finally they have bought someone shorter than me!" Maradona would prove to be a big influence on Zola's career. The two would spend hours practising free kicks together after training and Zola later said that "I learned everything from Diego. I used to spy on him every time he trained and learned how to curl a free-kick just like him." Zola helped Napoli to win the Italian Super Cup in 1990, partnering alongside Careca following Maradona's drug ban during the second part of the 1990–91 season, as Napoli finished in a disappointing seventh place. Due to his individual performances, however, Zola was given his debut for the Italy national team under coach Arrigo Sacchi in 1991, winning his first cap against Norway in November. He temporarily inherited Maradona's number 10 shirt the following season under manager Claudio Ranieri, after Maradona parted ways with the club due to his ban, scoring 12 goals in 34 appearances. Upon his departure, Maradona had recommended that the Napoli management focus on Zola's development, stating: "Napoli doesn't need to look for anyone to replace me, the team already has Zola!". In his final season with the club, he managed 12 goals in 33 league appearances, and he also finished the 1992–93 Serie A season as the joint top assist provider in the league, with 12 assists, alongside Francesco Baiano. During his time in Napoli, Zola scored a total of 32 goals in 105 appearances. In 1993, Zola left Napoli and joined fellow Serie A side Parma for ₤13 million, due to poor economic situation of the Neapolitan club. He was initially accused of betraying the club by the fans, although Zola denied this, noting that Corrado Ferlaino had also been forced to sell other important Napoli players such as Jonas Thern, Ciro Ferrara and Daniel Fonseca, in order to overcome the club's debts. With Parma, he established himself as one of the league's top players, and he achieved notable domestic and European success; he came close to winning another Serie A title, in particular during the 1994–95 season, in which he scored 19 goals in a close fought title-race with rivals Juventus, although he ultimately failed to do so. In his first season, he scored 18 league goals, and with the club, he won the UEFA Super Cup in 1993, and the UEFA Cup in 1995 with Parma, and he also reached the final of the UEFA Cup Winners' Cup in 1994, as well as the finals of the Italian Cup and the Italian Super Cup in 1995. It was with the blue and yellow club that he cemented his reputation as one of the best and most talented creative players in Italy, along with Roberto Baggio and Alessandro Del Piero. During the 1995–96 season, Zola initially experienced competition in the team with Bulgarian forward Hristo Stoichkov, who played the same tactical role as Zola; as a result, Zola would begin to be deployed in the starting eleven with less frequency, losing his place in the squad, despite scoring 10 league goals. During the following season, manager Carlo Ancelotti came to see Zola as a "square peg" unable to fit into his rigid 4–4–2 system upon his arrival at the club in 1996. Zola was played out of position in a left midfield role, scoring only 2 goals, as Ancelotti preferred to play Hernán Crespo and Enrico Chiesa up-front. Zola became frustrated of playing in this role and ultimately made himself available for a transfer, moving to Premier League side Chelsea in November 1996. In total, Zola made 102 league appearances with Parma, scoring 49 goals. In November 1996, Zola joined Chelsea for £4.5 million as one of several continental players signed by Ruud Gullit (including compatriot Gianluca Vialli) and was assigned the number 25 jersey. He made his debut in a 1–1 draw with Blackburn Rovers at Ewood Park. In his debut season he demonstrated his skill and talent, and put in several notable performances, scoring a series of memorable goals. In February 1997, after spiriting the ball around Manchester United's defence in the penalty area before slotting the ball past goalkeeper Peter Schmeichel, he was described by United manager Alex Ferguson as a "clever little so-and-so." He was a key player in Chelsea's resurgence in the 1996–97 season, helping them win the FA Cup with a 2–0 win over Middlesbrough at Wembley Stadium having scored four goals en route to the final, including a 25-yard curling shot against Liverpool as Chelsea came from 0–2 behind to win 4–2, and a memorable goal of individual skill in the semi-final against Wimbledon, backheeling the ball and turning 180 degrees before slotting the ball into the net. At the end of the season he was voted FWA Player of the Year, the only player ever to win the accolade without playing a full season in the English league and the first Chelsea player to win it. In the 1997–98 season, Zola helped Chelsea win three more trophies, the League Cup, the Cup Winners' Cup and the Super Cup. An injury denied him a place in the starting line-up for the Cup Winners' Cup final against Stuttgart at the Råsunda Stadium in Stockholm, but he still played an important part in Chelsea's victory, as he came on as a second-half substitute and scored the winning goal after barely 30 seconds. With only his second touch of the game, he struck a through ball from Dennis Wise into the roof of the net to secure Chelsea's third major trophy in a year and the second European trophy in the club's history. In the same season, Zola hit his first professional hat-trick, in a 4–0 victory over Derby County at Stamford Bridge in November 1997. "Gianfranco tries everything because he is a wizard and the wizard must try." — Claudio Ranieri reflecting on Zola's back-heeled goal against Norwich in 2002. 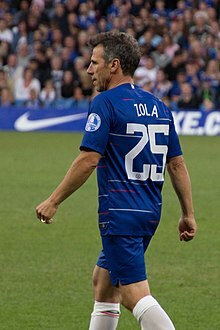 Zola in 2018, playing for Chelsea Legends. Since his departure from the club in 2003, the number 25 shirt has not been worn by any other Chelsea player. When Chelsea made their first appearance in the Champions League in 1999–2000, Zola was a key player throughout the campaign, although he found his chances in the Premier League more limited, owing to manager Gianluca Vialli's squad rotation policy. Zola scored three goals in Chelsea's run to the Champions League quarter-finals, including a curling free kick against Barcelona, and he again won the FA Cup with the club, with his free-kick in the final against Aston Villa setting up Roberto Di Matteo's winner. His later years with Chelsea saw his appearances restricted by the new strike pairing of Jimmy Floyd Hasselbaink and Eiður Guðjohnsen. During the 2000–01 Premier League season, Zola managed 9 league goals. In the 2001–02 season, Zola's starting chances became limited, after a summer when Claudio Ranieri showed the door to many of Chelsea's ageing stars such as club captain Dennis Wise, goalscoring midfielder Gustavo Poyet and French defender Frank Leboeuf, scoring only 3 goals. Zola was limited to infrequent starts and many substitute appearances due to Ranieri's new policy of decreasing the average age of the Chelsea squad, preferring to play the gifted Icelandic youngster Gudjohnsen with Hasselbaink. Zola did draw attention, however, for his dominant performance when he scored with a notable backheeled effort in mid-air from a corner-kick, in an FA Cup tie against Norwich City on 16 January 2002. Manager Claudio Ranieri described the goal as "fantasy, magic". In 2002–03, his final season with Chelsea, he enjoyed a renaissance, scoring 16 goals, his highest seasonal tally for Chelsea, and was voted the club's player of the year after helping Chelsea qualify for the Champions League. Zola scored his final goal for Chelsea, a lob from outside the penalty area against Everton, on Easter Monday 2003, and made his final competitive appearance for the club on the final day of the season with a 20-minute cameo against Liverpool, beating four Liverpool players during a fantastic dribble late on in the match, gaining applause from both sets of fans. This would become the final class moment of his Chelsea career. He played in a total of 312 games for Chelsea and scored 80 goals, scoring 59 goals in 229 Premier League appearances. He subsequently decided to return to Italy during the following season. In early 2003, Zola was voted as the best ever Chelsea player by Chelsea's fans. In November 2004, he was awarded an OBE, Honorary Member of the Order of the British Empire in a special ceremony in Rome. In 2005, Zola was voted into the Chelsea F.C. Centenary Eleven, occupying one of the two forward roles. No other Chelsea player has held Zola's number 25 shirt since his departure, prompting some to report that the squad number has been retired. Despite such reports, the club has not officially withdrawn it from circulation. In 2007, Zola was also voted by The Sun one of the top ten best foreign "artistic" players in Premier League history, coming in second place, behind George Best. In the summer of 2003, amid rumours of an impending takeover at Chelsea, Zola left Stamford Bridge to join Cagliari, from his native Sardinia. Within a week Chelsea was acquired by Russian billionaire Roman Abramovich. It was reported that Abramovich tried to buy the entire Cagliari club when Zola refused to renege on his verbal contract with Cagliari, although Zola himself will not confirm it. Zola subsequently led Cagliari to promotion to the Italian Serie A. Then he renewed his contract for Cagliari Calcio for one more year. He retired in June 2005, after ending his career in appropriate style with a double against Juventus in his last ever professional game. His number 10 Cagliari jersey was withdrawn in his honour for the season after he left but was worn in the 2006–07 season by Andrea Capone. Zola retired as the fifth highest goalscorer of free-kicks in Serie A history, with 20 goals from set-pieces, and currently sits behind only Francesco Totti and Roberto Baggio (both at 21), Alessandro Del Piero (22), Andrea Pirlo and Siniša Mihajlović (both at 28). Zola made his debut for Italy on 13 November 1991 in Genova, under manager Arrigo Sacchi, at the age of 25, in a Euro 1992 qualifier against Norway, which ended 1–1. He appeared at the 1994 World Cup in the United States, making one substitute appearance in the second round knock-out match against Nigeria in Boston. After only twelve minutes, Zola was controversially sent off, after fouling Augustine Eguavoen, which forced him to miss the two subsequent World Cup matches. Although Italy managed to reach the World Cup final, Zola did not regain his place in the side after this suspension. His first two goals came on 25 March 1995, in a 4–1 win, in a Euro 1996 qualifier against Estonia in Salerno. Zola was called up for Euro 1996, and he played in all three group games at the tournament. He set up Pierluigi Casiraghi's second goal in the team's 2–1 win in the opening group match against Russia, but in the team's final group match, he notably missed a potential match-winning penalty in a 0–0 draw against eventual champions Germany as Italy surprisingly crashed out in the first round; the win would have allowed Italy to progress to the quarter-finals of the tournament. He scored the only goal of the game in an historic 1–0 victory over England in a 1998 World Cup qualifying match at Wembley, on 12 February 1997. He won his final cap for Italy in the return fixture against England in Rome on 11 October 1997, which ended in a draw. He retired from international play after he was not called up for the 1998 World Cup by manager Cesare Maldini, who had selected Del Piero and Roberto Baggio in his role. Zola finished his international career with a total of 35 caps and ten goals. In his playing career, Zola played 628 games and scored 193 goals. Despite speculation he would play on in the 2005–06 season, Zola decided to leave the game just a week before he turned 39, and took a job as an Italian football pundit. Rumours were circulating within Australia that Zola was being chased by several A-League clubs, including Sydney, Melbourne Victory and Perth Glory, about a possible comeback, but Zola quashed such rumours. He did, however, play a charity match in Sydney in December 2006, appearing in both Marconi Stallions and APIA colours. Zola also played against Shrewsbury Town in the first match at their New Meadow stadium for "A-line Allstars" on 14 July 2007 as part of a kit sponsorship deal between the club and boot manufacturer A-line, who made Zola's boots. In 2006, Zola started his coaching career, being appointed as assistant manager to Italy U21 manager and Pierluigi Casiraghi by the Italian Football Federation. The duo led the azzurrini to the 2008 Olympics in Beijing, where they reached the quarter-finals before being defeated 3–2 by Belgium under-21s. 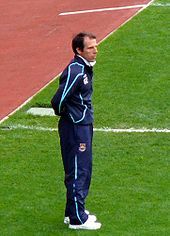 On 7 September 2008, it was reported that Zola had been interviewed in Rome for the vacant manager's position at West Ham United and had "impressed the Club's representatives" at the interview. Two days later, he agreed a three-year contract to manage West Ham United, replacing Alan Curbishley, who resigned following differences with the board. He was unveiled as manager on 11 September, despite not having the required UEFA A managing licence. Zola, surprisingly for someone closely associated with West Ham's cross-town rivals Chelsea, quickly gained the backing of the fans. Nevertheless, he received applause from Chelsea fans whenever he returned to Stamford Bridge as West Ham manager. After a shaky start Zola began to develop a side with a flair not seen in a West Ham side for some years. Zola also received praise for integrating more youth products into the first team. The likes of Junior Stanislas and Zavon Hines were given their debuts. The duo and first team youngsters Jack Collison and James Tomkins all scored their first goals for the club during his tenure. In April 2009, Zola signed a contract that could have kept him at Upton Park until 2013. West Ham struggled in the 2009–10 season. Zola's position as manager was put in doubt when he revealed he had not been consulted over a bid for West Bromwich Albion player Graham Dorrans and by chairman David Sullivan's announcement that the entire squad was for sale except for midfielder Scott Parker. West Ham finished in 17th place, only five points above the relegation places. On 11 May 2010, two days after the end of the 2009–10 season, West Ham announced the termination of Zola's contract with immediate effect. Avram Grant was announced as his successor on 3 June 2010, and a week later it was announced that the club had reached a compensation settlement with Zola. Zola was strongly linked with the managerial position at Watford in 2012, following the club's takeover by Udinese and Granada owner Giampaolo Pozzo. He was confirmed as Watford manager on 7 July, signing a two-year contract. In his first season, Zola led Watford to 3rd place and a play-off position, which then saw them progress to the final at Wembley. There, they lost 1–0 to 5th place side Crystal Palace after extra-time. On 16 December 2013, Zola resigned as Watford manager. At the time of his resignation, Watford were 13th in the league, had not won since October 2013 and had lost their last five home games. 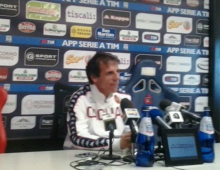 On 24 December 2014, Zola was appointed as the new manager of Cagliari following Zdeněk Zeman's dismissal. In his first match in charge, on 6 January 2015, Cagliari lost 0–5 at Palermo with Daniele Conti being sent off in the first half, the result keeping the club in the relegation zone. Two days later he completed his first transfer as manager of the club, taking centre-back Alejandro González on loan from fellow Serie A club Hellas Verona. Zola won his first game on 11 January 2015, a 2–1 win over Cesena. After less than three months as Cagliari's manager, Zola was sacked on 9 March 2015, after being unable to escape the relegation zone after 10 matches; following his dismissal, Zeman was reinstated as Cagliari's manager. On 11 July 2015, Zola was appointed coach of Qatar team Al-Arabi. After a poor first season in the Qatar Stars League, he was sacked, having achieved 10 wins from 26 games, losing 11, with the team placing 8th out of 14. On 14 December 2016, Zola was named manager of EFL Championship club Birmingham City, replacing Gary Rowett who had been sacked earlier that day. At the time, Birmingham sat 7th in the table, outside the playoff positions only on goal difference. Three days later, the team conceded a late goal to lose his first game in charge 2–1 at home to second-placed Brighton & Hove Albion. They did not win until Zola's 11th match in charge, a 1–0 win over Fulham on 4 February 2017. On 17 April, Zola resigned as manager following a 2–0 home defeat to Burton Albion which left the team just three points above the relegation zone with three matches remaining. They had won just twice during his 24-match tenure. On 18 July 2018, Zola was appointed as assistant first-team coach to Maurizio Sarri at Chelsea. During his playing career, Zola was primarily used as a supporting striker or as a playmaking attacking midfielder, due to his ability to create chances and provide assists for teammates; he was also deployed as a winger or even as a striker on occasion. A creative and technically gifted right-footed player, Zola was renowned for his ball control, his skilful dribbling ability, vision, and passing ability, as well as his tactical intelligence, ability to read the game and eye for goal. Although he was not physically imposing, his small stature and low centre of gravity gave him good balance and allowed him to be extremely quick and agile, which, along with his acceleration, speed, and ball skills, enabled him to change direction with the ball very quickly in tight spaces, and allowed him to beat defenders with feints in one on one situations. Zola was also a penalty kick and set piece specialist, who was particularly renowned for his accuracy at bending direct free-kicks. Due to his creativity and skill, Zola was given the nickname "Magic box" while playing at Chelsea. Zola is regarded as one of the best Italian creative forwards of his generation, and as one of the best players in Premier League history. Zola is married to Franca and has three children; his son Andrea plays for Grays Athletic and has played for West Ham United reserves. Zola features in EA Sports' FIFA video game series; he was named in the Ultimate Team Legends in FIFA 14. Zola was the subject of a long-running urban legend where it was believed by some people that he appeared in the video for Bonnie Tyler's 1983 song "Total Eclipse of the Heart". In a 2012 interview, Zola confirmed that he did not appear in the video. He has, however, appeared in a music video for the song "Zola" by Derry band Wonder Villains. Zola once appeared in an episode of Renford Rejects, where he played a match for the Rejects against the Renford Razors and Martin Keown. ^ a b c d "Zola: Gianfranco Zola: Manager". BDFutbol. Retrieved 22 December 2017. ^ a b c d e "caps and goals on figc.it" (in Italian). Italian FA (FIGC). Archived from the original on 26 November 2002. Retrieved 30 June 2011. ^ "quirinale.it". quirinale.it. 27 December 2003. Retrieved 29 April 2010. ^ a b c "Chelsea legend Zola awarded OBE". BBC. 1 November 2004. Retrieved 20 December 2006. ^ a b c "Zola Voted Greatest Ever Chelsea Player". Chelsea-mad.co.uk. 15 January 2003. Archived from the original on 27 March 2004. Retrieved 11 May 2009. ^ a b c d e f g h i j "AZZURRI PER SEMPRE – La classe di Gianfranco Zola: "The magic box"" (in Italian). Pianeta Azzurro. Retrieved 23 December 2014. ^ a b c d "Le confessioni di Zola "Io, tra Napoli e Londra..."" (in Italian). La Repubblica. 20 February 2012. Retrieved 23 December 2014. ^ "Gianfranco Zola: The Ambassador". Channel4.com. Archived from the original on 19 February 2007. Retrieved 20 December 2006. ^ a b Fulvio Bianchi (11 June 1997). "'MA NON E' IL MIO RUOLO'" ['But it isn't my position'] (in Italian). La Repubblica. Retrieved 17 September 2015. ^ a b Maurizio Mariani; Misha Miladinovich (31 October 2000). "Italy Championship 1992/93". RSSSF. Retrieved 17 September 2015. ^ a b "ZOLA SALUTA ' CEDUTO PER PAGARE I DEBITI'". Retrieved 23 December 2014. ^ a b "ZOLA PIU' DEL PIERO ' QUESTIONE DI TALENTO'". Retrieved 23 December 2014. ^ a b "MERAVIGLIE D' ITALIA". Retrieved 23 December 2014. ^ a b "PARMA TORNA A SOGNARE". Retrieved 23 December 2014. ^ Marcotti, Gabriele (26 May 2005). "Tactical switch". The Times. London. Retrieved 20 December 2006. ^ "Zola contro Ancelotti, la sfida inglese voluta dal destino". Retrieved 23 December 2014. ^ a b "TUTTI PAZZI PER ZOLA 'QUI MI VOGLIONO BENE'". Retrieved 23 December 2014. ^ Jacob Steinberg (21 December 2016). "Golden Goal: Gianfranco Zola for Chelsea v West Ham (1996)". The Guardian. Retrieved 2 March 2017. ^ "ZOLA E' SEMPRE DA APPLAUSI". Retrieved 23 December 2014. ^ "ZOLA FA LA STAR E SPINGE VIALLI IN PANCHINA". Retrieved 23 December 2014. ^ a b c d e f g "Gianfranco Zola". The Independent. Retrieved 28 September 2014. ^ "Chelsea prepare for Euro glory". BBC Sport. British Broadcasting Corporation. 12 May 1998. Retrieved 4 December 2011. ^ "Zola's first kick is the sweetest for Chelsea". BBC Sport. British Broadcasting Corporation. 13 May 1998. Retrieved 4 December 2011. ^ "Chelsea, trionfo all' italiana Zola segna un gol miracolo". Retrieved 23 December 2014. ^ Szreter, Adam (1 December 1997). "Football: Chelsea finally display their credentials as championship contenders". The Independent. London: Independent Print Limited. Retrieved 4 December 2011. ^ "Gianfranco Zola – A Football Legend Profile". TalkFootball.co.uk. Retrieved 24 November 2008. ^ "I 10 gol più belli della storia del calcio: Zola, Chelsea-Norwich City 2001–02". Retrieved 23 December 2014. ^ "Io, Zola, eroe d' Inghilterra per caso". Archived from the original on 18 May 2009. Retrieved 23 December 2014. ^ "Zola adds his touch of magic". The Guardian. 17 January 2002. Archived from the original on 21 October 2007. Retrieved 20 December 2006. ^ Bellwood, Tom; Breton, Mike (5 February 2010). "Spurs No 10, Chelsea No 25, United No 7, West Ham No 6 and Newcastle No 9: So what's the iconic shirt at your club?". Daily Mail. London. Retrieved 29 October 2012. ^ a b "Best, Zola, Gascoigne Ecco gli artisti del pallone" (in Italian). La Gazzetta dello Sport. 11 November 2012. Retrieved 24 September 2014. ^ Viner, Brian (2008). "Gianfranco Zola: 'Will I come back to Chelsea as a coach? I think so'". The Independent. London (published 21 March 2008). Retrieved 30 April 2008. ^ "Zola swans into Australia". ^ "Pirlo, punizioni da record: Sinisa è sempre più vicino" [Pirlo, record-breaking free-kicks: Sinisa's record is not far away]. sport.sky.it (in Italian). Sky Sport. 11 November 2013. Retrieved 9 March 2015. ^ "TUTTI INSIEME, CONTRO L' ARBITRO" (in Italian). La Repubblica. 6 July 1994. Retrieved 23 December 2014. ^ "ZOLA ESPULSO ' CHE RABBIA, HO PIANTO'" (in Italian). La Repubblica. 6 July 1994. Retrieved 23 December 2014. ^ "FIFA Player Statistics: Gianfranco ZOLA". FIFA.com. Archived from the original on 19 May 2010. Retrieved 11 May 2010. ^ Giancarlo Padovan (26 March 1995). "Quattro piccoli gol da un' Italia senza allegria" [Four small goals from an Italian side which lacks happiness] (in Italian). Il Corriere della Sera. Archived from the original on 18 October 2015. Retrieved 17 September 2015. ^ "ZOLA PIANGE ' CHIEDO SCUSA'" (in Italian). La Repubblica. 20 June 1996. Retrieved 23 December 2014. ^ "STORICO ZOLA, WEMBLEY ALL' ITALIANA" (in Italian). La Repubblica. 13 February 1997. Retrieved 23 December 2014. ^ a b c d "Gianfranco Zola" (in Italian). Storie di Calcio. Retrieved 17 September 2015. ^ a b "Gianfranco Zola – Goals in International Matches". www.rsssf.com. Retrieved 5 July 2015. ^ "Zola talks down A-League tilt". Fox Sports. 25 December 2006. Archived from the original on 6 January 2007. Retrieved 30 December 2006. ^ "Gentile makes way for Casiraghi". UEFA.com. 24 July 2006. Retrieved 30 June 2011. ^ Barder, Russell (14 December 2008). "Chelsea 1–1 West Ham". BBC News. ^ Paul Doyle (7 February 2009). "Paul Doyle talks to Gianfranco Zola and examines the Italian's transformation of West Ham United". The Guardian. London. Retrieved 29 April 2010. ^ "Zola to stay true to Hammers' youth system". espn.com. 23 September 2008. Retrieved 7 November 2009. ^ "Gianfranco Zola committed to West Ham after signing new contract". The Guardian. London. 25 April 2009. Retrieved 29 April 2010. ^ "West Ham sack manager Gianfranco Zola". BBC Sport. 11 May 2010. Retrieved 11 May 2010. ^ "Gianfranco Zola & West Ham reach settlement". BBC Sport. 10 June 2010. Retrieved 11 June 2010. ^ "Zola confirmed as Watford boss". Archived from the original on 8 July 2012. ^ "BBC Sport – Championship play-off final: Crystal Palace v Watford". BBC Sport. Archived from the original on 18 October 2015. Retrieved 17 June 2015. ^ "OFFICIAL: Gianfranco Zola Resigns". Archived from the original on 16 December 2013. ^ "Gianfranco Zola resigns as Watford head coach". BBC Sport. Retrieved 17 December 2013. ^ "Bentornato Gianfranco". Cagliari Calcio (in Italian). 24 December 2014. Retrieved 24 December 2014. ^ "Palermo 5–0 Cagliari". BBC Sport. 6 January 2015. Retrieved 6 January 2015. ^ "Cagliari, è ufficiale: Alejandro Gonzalez agli ordini di Zola" [Cagliari, it's official: Alejandro Gonzalez to the orders of Zola]. La Nuova Sardegna (in Italian). 8 January 2015. Retrieved 9 January 2015. ^ "Cagliari 2–1 Cesena". ESPN. Press Association. 11 January 2015. Retrieved 11 January 2015. ^ "Gianfranco Zola sacked as Cagliari coach after less than three months in job". The Guardian. 9 March 2015. Retrieved 9 March 2015. ^ "Zola sacked by Qatari club Al-Arabi". 27 June 2016. ^ "Birmingham appoint Gianfranco Zola as their new manager". Sky Sports. 14 December 2016. Retrieved 29 January 2017. ^ "Birmingham City: League Championship table after close of play on 13 December 2016". 11v11.com. AFS Enterprises. Retrieved 18 April 2017. ^ "Birmingham City 1–2 Brighton & Hove Albion". BBC Sport. 17 December 2016. Retrieved 29 January 2017. ^ "Gianfranco Zola delighted with first Birmingham win". Sky Sports. PA Sports. 5 February 2017. Retrieved 18 April 2017. ^ "Gianfranco Zola: Birmingham City manager resigns after four months". BBC Sport. 17 April 2017. Retrieved 18 April 2017. ^ "Welcome home Gianfranco". Chelsea F.C. 18 July 2018. ^ "Zola contro Ancelotti, la sfida inglese voluta dal destino" (in Italian). Sky. 17 December 2009. Retrieved 24 September 2014. ^ LIAM TWOMEY (8 November 2016). "Gianfranco Zola at Chelsea: Blues celebrate 20 years after Italian signed". ESPN FC. Retrieved 2 March 2017. ^ "Cagliari, Barella e i grandi sardi dello sport: "Voglio essere come Zola, Aru e Datome"" (in Italian). sport.sky.it. 19 January 2018. Retrieved 12 October 2018. ^ Giampiero Timossi; Alessandra Gozzini (11 April 2006). "Zola, futuro coi giovani e cuore rossoblù "Sono certo che il mio Cagliari ce la farà"" (in Italian). La Gazzetta dello Sport. Retrieved 13 October 2018. ^ a b "Gianfranco Zola" (in Italian). Il Sardo. Retrieved 24 September 2014. ^ "Premier League's best ever strikers". dailymail.co.uk. The Daily Mail. Retrieved 23 January 2015. ^ Williamson, Laura (20 April 2014). "West Ham 5 Burnley 3". London: Daily Mail. ^ "Football Legends Coming to FIFA 14 Ultimate Team". easports.com. EA Sports. 30 August 2013. Retrieved 17 March 2015. ^ "Chelsea great Gianfranco Zola: 'I don't star in Bonnie Tyler's Total Eclipse of the Heart video'". Off the Post. 16 May 2012. Retrieved 5 September 2014. ^ "Wonder villains zola". YouTube. 23 June 2014. Retrieved 18 May 2016. ^ "Zola star in Wonder Villains video for song in honour of himself". Mail Online. Retrieved 18 May 2016. ^ "12 Famous Cameos In Nickelodeon's Renford Rejects". balls.ie. 19 September 2014. Retrieved 18 May 2016. ^ "Gianfranco Zola". Soccerbase. Retrieved 28 September 2014. ^ "Gianfranco Zola » Partite di club". calcio.com. ^ bold.dk. "Pro Patria - Cagliari, Coppa Italia 2003/2004 17/8-2003". bold.dk. ^ a b c "Gianfranco Zola". 123Football. Archived from the original on 30 August 2014. Retrieved 28 September 2014. ^ "Gianfranco Zola: Overview". Premier League. Retrieved 27 September 2018. ^ "The 2013/14 Chelsea Player of the Year awards ceremony takes place on Monday 12 May, with tickets for the event on sale now". Chelsea FC. Archived from the original on 4 March 2016. Retrieved 28 September 2014. ^ "CALCIO, A ZOLA IL PALLONE D'ARGENTO DELL'USSI" (in Italian). La Repubblica. Retrieved 21 January 2015. ^ "Chelsea Centenary XI". Chelsea F.C. 4 August 2005. Archived from the original on 5 June 2011. Retrieved 30 June 2011. ^ "Premio Nazionale Carriera Esemplare Gaetano Scirea: Alba d'Oro" (in Italian). Retrieved 21 January 2015. ^ "A Gianfranco Zola il Premio Facchetti 2010" [The 2010 Facchetti Award goes to Gianfranco Zola] (in Italian). La Gazzetta dello Sport. 4 November 2010. Retrieved 21 January 2015. Wikimedia Commons has media related to Gianfranco Zola.